Northern Rock has said that it made "good progress" in 2009, as it reported a sharp fall in its annual losses. The bank lost £257.4m last year, compared with £1.36bn in 2008. Since 1 January, the Rock has been split in two, with savers' money held by a "good bank", Northern Rock PLC, which will eventually be sold. The bank said it was paying staff £13.4m in bonuses after its losses narrowed - though chief executive Gary Hoffman had waived his payout. His long-term incentive scheme would only pay out after the bank returned to profit or was sold, the company said. Under the Treasury's bonus windfall tax, the bank will also have to pay £1.5m tax on its bonuses. 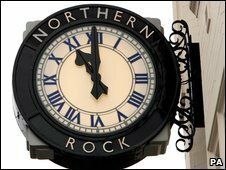 The eventual sale of Northern Rock PLC - expected later this year - will recoup some of the billions of pounds of public money that was injected into the bank to keep it going. The other half of the old bank - renamed Northern Rock Asset Management - holds most of the bank's old mortgages. After stripping out one-off gains, Northern Rock reported an underlying loss of £383m for the year. The bank said it had seen an increase in mortgage lending across 2009, while the amount of money people saved with the bank was largely unchanged. It added that the recession and higher unemployment levels meant the percentage of those borrowers more than three months in arrears with mortgages payments had risen to 4.28% by the end of the year - the equivalent of nearly 23,000 borrowers - compared with 2.25% a year earlier. This big jump in those defaulting on their home loans resulted in a rise in the Rock's bad debts from £870m to £1.17bn. But it insisted it was working to help those in debt, and that it had been less aggressive in repossessing the homes of people in arrears. The bank said its stock of repossessed properties fells to 2,061 by the end of last year, compared with 3,620 in 2008. The collapse of the Northern Rock in the autumn of 2007 signalled the onset of the banking crisis. The government stepped in with funds to try to stop a run on the bank, and Northern Rock was subsequently nationalised. Before the financial crisis Northern Rock employed 6,500 staff across the country, but this figure is now close to 4,500. Rob MacGregor, national officer at the Unite union, said the bank's results illustrated that the company was on "the right road for a gradual recovery". He called for management to give the workforce a commitment about the security of their jobs. "After the turbulence of the last few years this is now well overdue," Mr MacGregor said. Last month, it was announced that savers with money in the Northern Rock would lose the government's 100% guarantee on their deposits from 24 May. Savers will still benefit from the £50,000 guarantee to all savers under the Financial Services Compensation Scheme.